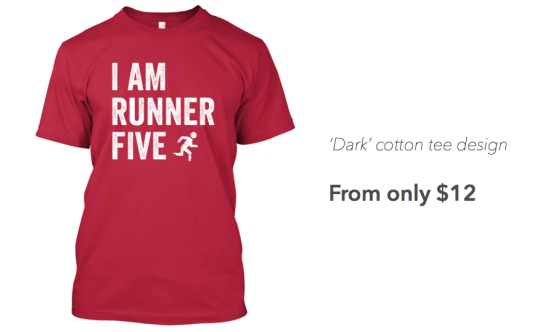 I Am Runner Five T-Shirt – Zombies, Run! There’s a moment that comes for every Zombies, Run! player. Maybe it’s the first time you outrun a zombie mob, your heart pumping and your arms raised in victory. Maybe it’s the morning when you wake up before your alarm, excited to head out and run. Or maybe it’s hitting your personal best for the third run in a row. 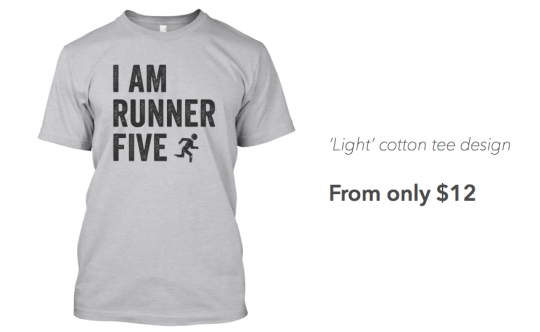 That’s the moment you say: I Am Runner Five. And when it comes, we have the perfect t-shirt for you. 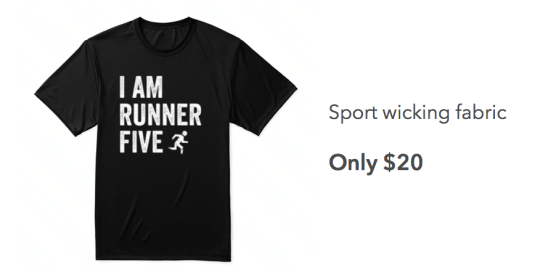 Designed by the shockingly talented Estee Chan, this tee is available in two designs in 100% cotton (light cotton tee, dark cotton tee) from only $12, and as a sport tee with wicking fabric from $20. Whether you’re looking for the perfect thing for your local fan meet up — or for your next 10k race — we’ve got your back. All of these tees are available right now on Teespring, but will only be on sale for two weeks, so get moving!